Isabelle Stephen, Guy Renaud, and Jonathan Jarry from Moutons No More will be the guests of Toula Drimonis this Saturday around 10:30PM on CJAD 800AM (800 kHz on AM or listen live on the Web). If you are reading this after the show, have a look at all of our productions listed under the main menu. We have a public science blog (Cracked Science), a podcast (Within Reason), various video blogs, and a live stage show which is happening this Sunday at 5PM at Pub St-Paul in Old Montreal! 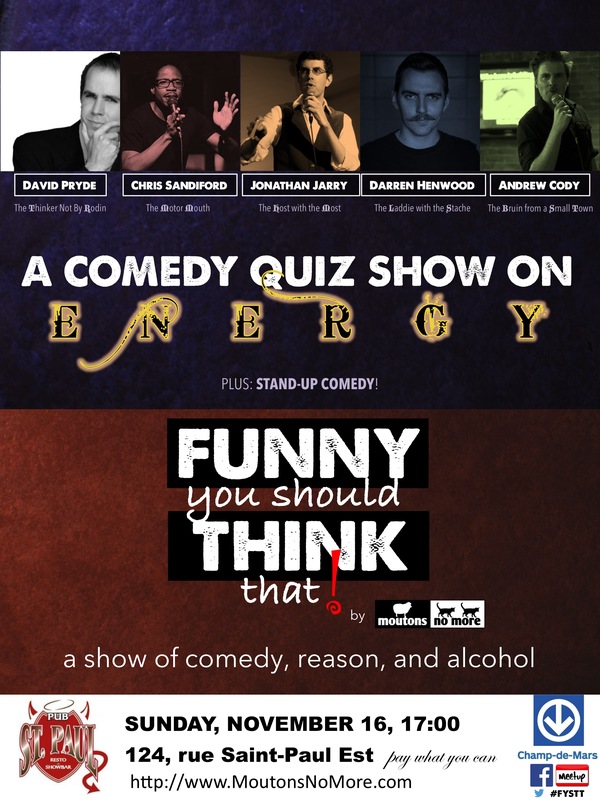 Comedians Darren Henwood, David Pryde, and Chris Sandiford will join Andrew Cody on the panel of our very own comedy quiz show, hosted by Jonathan Jarry, followed by stand-up comedy. It’s an event not to be missed! They said they were funny on the radio. I won’t believe it until I see a show.